India is a country which is highly populated and people in the country opt for many types of jobs for their livelihood in the sectors like primary, secondary and tertiary sectors. The most important comparison can be made between organised sector and unorganised sector. The main aim of this article is to depict the differences between organised sector and unorganised sector in relation with indian economics. 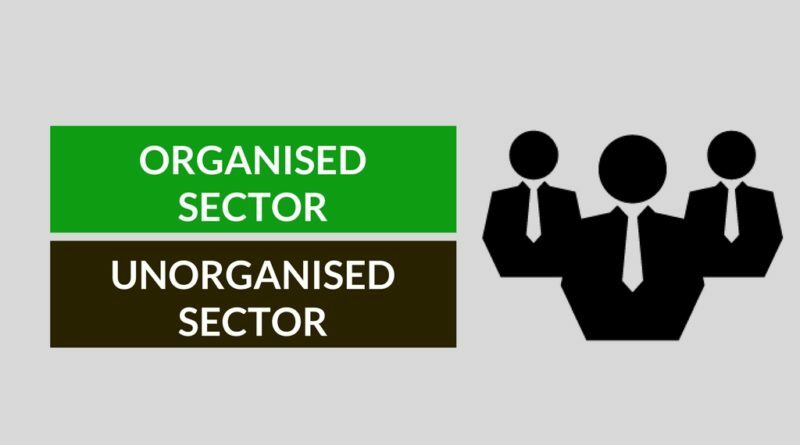 The sector which is registered and follows government rules and regulations, having employees and employee unions is called as organised sector. In India, banks, railways, insurance industry, central government employees, etc can be called as an Organised Sector. This sector works according to the certain rules and regulations given in the law. Organised sector has some formal processes and procedures. The Unorganised sector of the economy refers to the house-hold manufacturing activity and small scale and tiny sector of the industry. it is remained largely outside the control of the government. The businesses in this sector requires less man-power and investment. Agricultural labourers, small and marginal farmers, artisans like weavers, carpenters, blacksmiths, etc constitute unorganised sector. Organised sector covers the businesses where the terms of employment are regular and people have assured jobs. Unorganised sector is constituted by the small and scattered units which have remained outside the control of the government. Government laid rules and regulations to follow. There are rules and regulations, but are not followed. The salaries are paid as per Basic Wage Act. The wages are low and irregularly paid. The people enjoy the security of employment in organised sector. The employment is not secured in Unorganised sector. Employees in organised sector enjoy insurance and medical claims and benefits. Workers in unorganised sector don not have any insurance or medical benefits. The employees of the organised sector cannot be forced to leave the job without any strong reason. The workers in the unorganised sector can be asked to leave the job without any reason. The employees of the organised sector is only 8% of the total people but constitute 50% of the GDP of India. The Unorganised sector constitutes 92% of the employed people and constitutes only 50% of the GDP of India. The employees of the organised sector have extra benefits like overtime pays, paid leaves, medical leaves, etc. The people in the unorganised sector don't have any extra benefits. From the above discussion, we can conclude that both organised and unorganised sectors are prevalent in the country and contributes their share for the development of the economy but organised sector have many advantages because its employees enjoy more benefits, earn more money, have job security, etc when compared to employees of the unorganised sector.